Elegant aluminum profile place on the perimeter of the opening, entirely adjustable and easily modifiable, it completely covers the space’s needs for sharp, contemporary design in the bathroom. Choosing between corner or straight arrangements, with one or two sliding panes, creates a range of options which guarantees a solution for any space. The device uses tempered 8mm to 10mm glazing of any color, and aluminum profiles come in natural anodization, stainless steel imitation, or can be painted electrostatically in a wide range of colors. The bottom-end profile of the device separates the model into two different versions: U and W; the former refers to a single-track driver, and the latter to a double-track driver, with two sockets for the glazing – the main difference being than the thinner U profile does not allow scale to accumulate as quickly as the double W driver. Recessed handles, a runoff gutter for efficient drainage and water-tightness, magnetic joint-covers between the glass-boards, smooth sliding motion and safety breaks, are just some of our factory specifications which guarantee a long product life. The SH 56 45 glass shower cabin system can be used for the construction of either straight or cornered showered cabin. 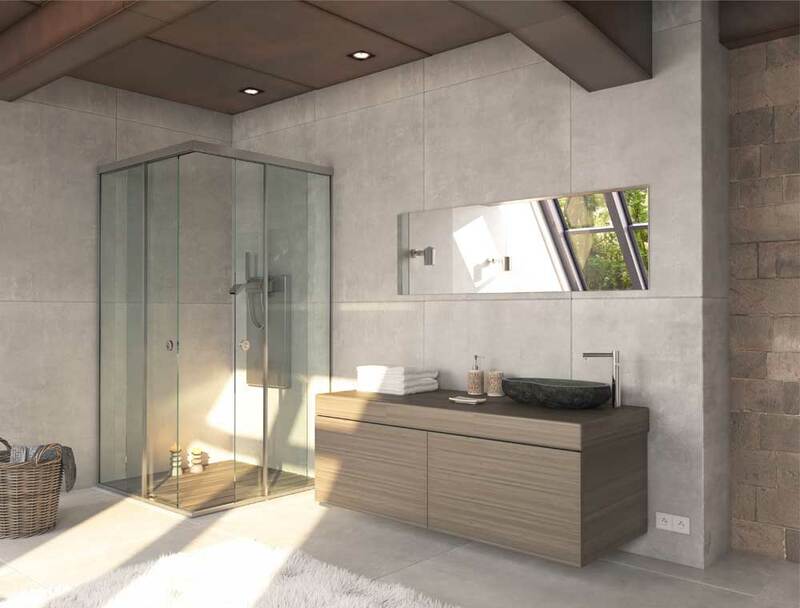 Design flexibility: : The glass shower cabin offers a lot of design flexibility, since it can be adjusted to fit the desired dimensions, by considering any occurring particularities (e.g. uneven or skewed or dented openings and others). Contemporary design: : The design of this device matches with a contemporary, industrial design style, in harmony with every other of our company’s products, in case they too happen to be installed in the same space.